Garfield Ridge Shelter is closed from September 14th (that's today!) until October 1st. The campsite will remain open for tenting on the platforms during this time. The old shelter is being removed and a new one will be assembled on-site. Garfield Ridge is the second oldest shelter in the fleet of 10 shelters AMC manages on the WMNF and MBPL, and has received a beating from both weather exposure and high use. The shelter was built in 1971, with the roof replaced in the mid 1990s. The shelter is a pre-built design by a log home company from Whitefield, NH; it is the same basic design and company as the AMC’s Full Goose shelter in Maine. This is the first shelter at the site, which was constructed in 1970 and 1971 to replace the former shelter and campsite location at Garfield Pond. Garfield Ridge Campsite itself is one of our flagship sites, intelligently designed and carefully maintained. It sees a wide variety of visitors, from Appalachian Trail through hikers to camp groups, and often to those caught unawares by the weather. Posts by the 2010 Garfield Ridge Caretaker can be found here and here. The new shelter is being pre-built off-site by John Nininger's Wooden House Company. 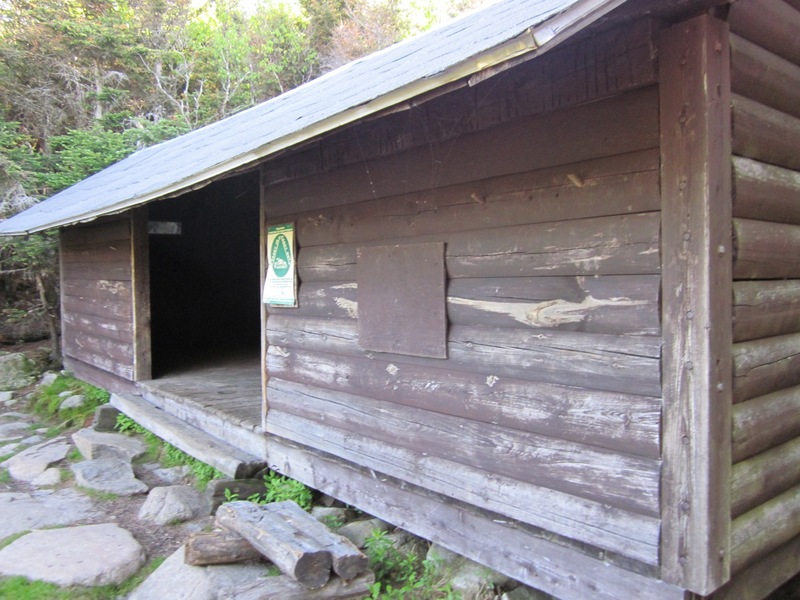 John has been contracted in recent years to build Kinsman Pond Shelter (2007) and Eliza Brook Shelter (2010). His experience with logs started with AMC on trail crew in the 1970s, and building Carlo Col Shelter and Imp Shelter. Internationally recognized for his talent with full-scribe log joinery, John squeezed this project in with a 6 week trip to Poland with the Timber Framer's Guild. Design considerations for the new shelter included the capacity, footprint, and character of the campsite itself. Planning for the project took place over the past year between AMC, the Appalachian Trail Conservancy and the Regional Partnership Committee, and the US Forest Service. It is a unique design, unlike any other shelter in AMC's fleet. And, of course, displaying the artisanal touch and quality craftsmanship that John brings to every project. We will post more pictures as the project progresses towards completion. Stay tuned.